I’m sure Samsung is happy about this…. 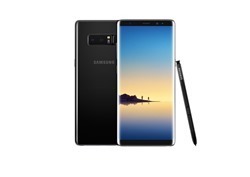 Samsung Electronics America, Inc. announced today that more people in the U.S. have purchased the Galaxy Note8 than previous Samsung Note phones during the same time period. Introduced on August 23, the Galaxy Note8 — featuring the largest ever screen in a Note device, an enhanced S Pen1, and the world’s first smartphone with two 12MP rear cameras with Optical Image Stabilization (OIS) on both the wide-angle and telephoto lenses — will be available in stores on September 15. “We’re thrilled to see the strong consumer response to the next level Note,” said Tim Baxter, president and chief executive officer, Samsung Electronics North America. “Today’s consumers want to do bigger things in work and life, and Note helps make that possible. We built the Galaxy Note8 for people who desire a device that lets them be productive and allows for self-expression." The Galaxy Note8 builds upon Samsung’s legacy of innovation. In 2011, Samsung pioneered the big-screen smartphone category with the original Galaxy Note. Since then, the Note series has continued to define and redefine this space by introducing cutting-edge features like the iconic S Pen, fast wireless charging2, as well as water and dust resistance3. The Galaxy Note8 reimagines the big-screen smartphone all over again, with an immersive 6.3 inch Infinity Display in a narrower form factor that makes it easy to hold in one hand or slip in a pocket. Consumers who purchase a Galaxy Note8 between August 24, 2017, and September 24, 2017, get their choice of a free Samsung Gear 360 camera ($229.99 retail value) or a free Galaxy Foundation kit with a Samsung 128GB EVO+ microSD card and Fast Charge Wireless Charging Convertible ($189.98 retail value). The promotion will last for a limited time and only while supplies last4. Terms and conditions apply. Visit samsung.com/us/promotions for more information. Visit Samsung.com, BestBuy.com or wireless carriers today to place your preorder. 2 Fast charging requires Adaptive Fast Charging (AFC) or Quick Charge 2.0-compatible charger to work. Testing under laboratory conditions. Results may vary. Battery power consumption depends on factors such as network configuration, signal strength, operating temperature, features selected, vibrate mode, backlight settings, browser use, frequency of calls and voice, data and other applications usage patterns. 4 Promotions are subject to change.